Listen up! We need your urgent help tonight. We’ve just rescued a baby orangutan who was wandering alone. Unfortunately, it looks like his mother has sadly passed away. We’ve taken the poor scared orangutan into quarantine at Samboja Lestari, Indonesia and he’s getting 24-hour care. Without rescuing this little baby, he surely would have died. However, the vet bills, medicines, tests, food and care comes at significant cost. We urgently need to raise $2,250 to help cover all the costs associated with this rescue. 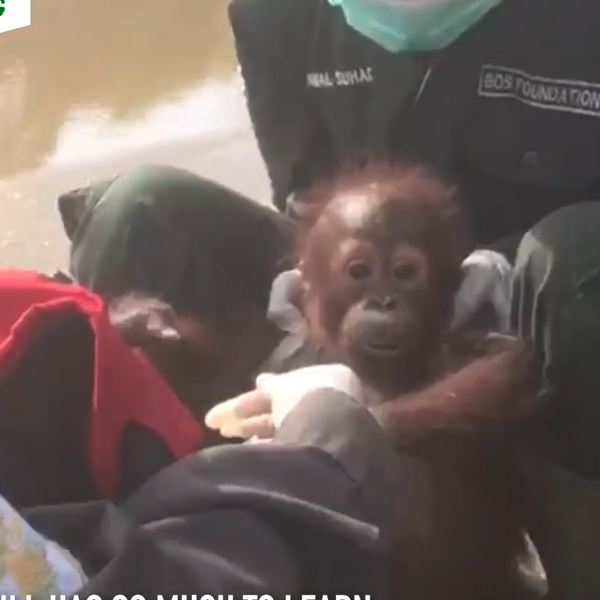 We just couldn’t say NO to this orangutan but we need your help right here right now. If 450 of you donated just $5 each we would reach our target. Can you please help this poor orangutan have a better life? Please help now. Thank you for all your wonderful work with these beautiful animals. Good luck and best wishes. Sorry I could not give more. Keep up the good work caring for this precious baby.. Under sad circumstances, great work as always BOS. Happy to contribute, and I ll hope like crazy this little one survives.